Crossover Review: As you probably already know, crossovers are today’s name for what we used to call station wagons - they “cross over” between truck-based SUVs and car like cargo-haulers. Crossovers offer the practicality and higher seating position of an SUV, with the greater comfort and somewhat better fuel economy of a car. Crossover sales surpassed those of traditional SUVs last year, and the trend line is heading upward fast. Ford hopes to do well in the segment with the Taurus X combined with its smaller five-passenger Edge. Ford debuted its crossover as the Freestyle in 2004 as a 2005 model. Highly touting its credentials as a family wagon in the Explorer tradition, the Ford folks had high expectations for their Volvo-based wagon. Well, despite some decent press reviews press, the Freestyle didn’t sell like the old Explorer did, and neither did its companion, the Five Hundred sedan. So, what did Ford do? They publicly declared that they would bestow the hallowed name of Taurus on both cars, so we now have a Taurus (again) and the Taurus X. From what I have heard, the name change has not improved sales rates, although the new cars are significantly better than their predecessors. I drove 2005 Freestyle nearly three years ago, and it seemed pretty nice, despite unconvincing wood like trim and a fairly modest 3.0-liter engine with a continuously variable transmission. The good news is, the new Taurus X is better looking, featuring Ford’s new signature three-strip chrome grille, and has acquired some real muscle under the hood. Its 3.5-liter V6 puts out 263 horsepower instead of the 3.0’s 203 - a nearly 30 percent improvement. The two-ton car moves along smartly through its new six-speed automatic transmission. The only real loss is in fuel mileage. Posted figures for all-wheel drive models like my “Alloy Clearcoat Metallic” test vehicle are 15 City, 22 Highway- I averaged 14.6 mpg. Granted, the 2008 numbers are lowered for all cars from the 2007 figures, but that’s still not that great. The environmental story is better, though. The 3.5-liter Duratec earns a stellar 9.5 out of 10 for its Air Pollution score. The Greenhouse Gases score is an average 5, but that’s not unusual for an engine of three-and-a-half liters displacement. 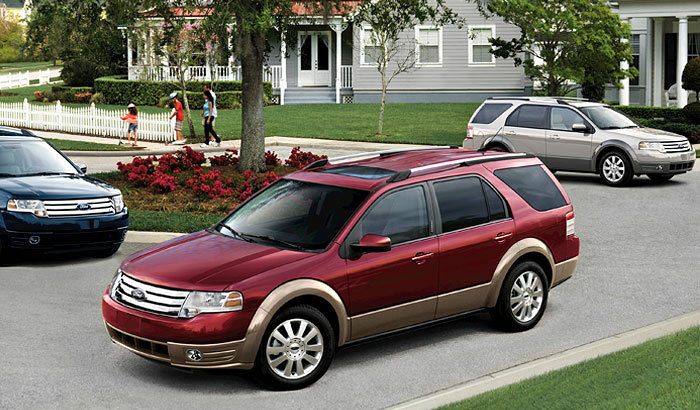 You can buy a Taurus X in three levels - SEL, Eddie Bauer, and Limited. All are all built in Chicago. My tester was the Eddie Bauer model, with its unique two-tone paint, larger 18-inch wheels, and special badging. This is the first time that the Eddie Bauer package has migrated from its original home on Explorers and Expeditions. Every Taurus X comes well equipped. Selected standard features include remote keyless entry, air conditioning, AM/FM audio system with CD, heated rear window, power driver’s seat, and the usual power windows, locks, and mirrors. My tester had Camel leather seating, too (is that leather made from camels or the color of camels?). Standard safety features include AdvanceTrac traction control and four-wheel anti-lock brakes. AdvanceTrac keeps your car heading where you want it to go by actually predicting the vehicle’s path using a sensor and then making adjustments to the engine torque and brakes. Anti-lock brakes help prevent skids and are becoming a standard for almost every car these days. The Taurus X is rated the safest seven-passenger crossover in America. It aced the government crash tests and got a “Top Safety Pick” rating from the Insurance Institute of Highway Safety. It boasts a multitude of airbags, including the Safety Canopy side curtain air bag for all three rows of seats. You can easily pack the Taurus X with options - my tester had $5,540 worth of them. These included a navigation system, power liftgate, Sirius Satellite Radio, heated seats, chrome rims, a DVD Family Entertainment System, and a reverse sensing system that beeps when there’s something nearby when you’re backing up. All worthy, but the final price, with transportation charges, came to $37,110. You can buy an SEL with front-wheel drive starting at $27,605. One intriguing new feature available on the Taurus X is the SYNC system developed with Microsoft. A Ford exclusive (for now), it allows hands-free, voice-activated control of your phone and entertainment system. That may be the best safety feature of them all. My tester, sadly, didn’t have SYNC, but I will report on it as soon as I sample a Ford that has it. Handsome, roomy, and safe, the Taurus X seems like the right car for a lot of people right now. With fuel prices rising, more miles per gallon would be welcome, but if you’re carrying your whole family, it beats the Expedition, and is way easier to park, too.